How to draw face of Catwoman. Learn to draw face of a female anti-hero Catwoman from Video and step by step tutorial. In this tutorial, you will learn how to sketch and draw basic comics facial structure for female. Though drawing in comics style looks different from realistic approach, it is still base on realistic structure. Either portrait or figure in comics art form, both base on realistic study. If the proportion of the face or body is off, we can tell most of the time. But a lot of time, in comics the artist intentionally create exaggeration of proportion so that it would have more emotional or visual impact to the audience. Some succeed but some was not so lucky. So I would strongly recommend study real proportion or do realistic approach and life drawing along with your comics drawing practice. That way you will gain vast knowledge of how body works and what part of the body that you could play around with your exaggeration or accentuate. A lot of character design artists at Disney do this exact study. They would study real life model or animal from life drawing session, then they will put their knowledge of realism into their cartoon or comics design. The original Catwoman, Selina Kyle, first appears in Batman. She is a sometimes-adversary of Batman, known for having a complex love-hate relationship with him. In her first appearance, she was a whip-carrying burglar with a taste for high-stake thefts. Catwoman has been featured in an eponymous series that cast her as an antihero rather than a supervillain. Watch the video tutorial how to draw Catwoman’s face. 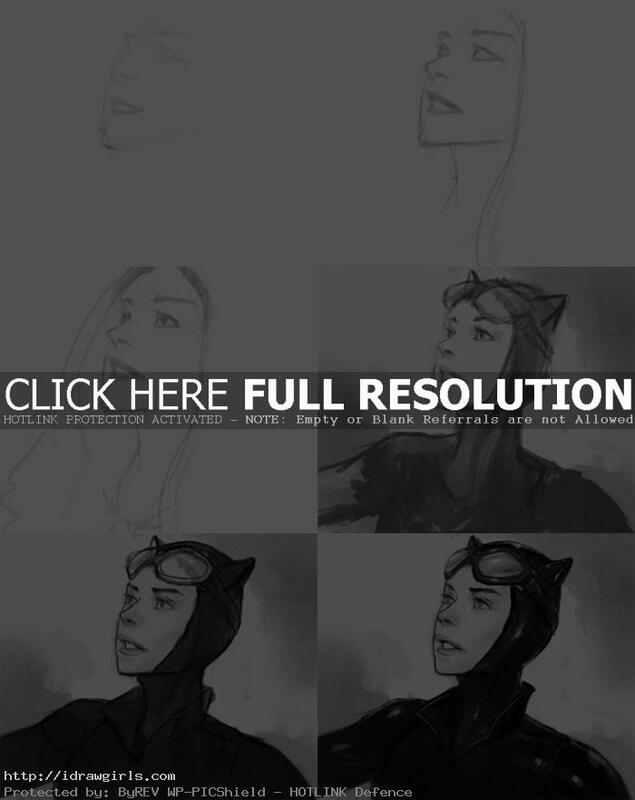 Below are step by step images how to draw face of a Catwoman. Step one, this one is slightly different than most of my how to draw face tutorial. I start of sketch without using construction line. I just draw her eye shape, eyebrows, tip of the nose and lips along with tip of her chin. Step two, from step one, I draw over the established element eyes, nose, lips and frame her face. Step three, now I draw her neck and add her iris. Step four, I then rough out her head gear and goggles along with her leather skin tight suit. Step five, now I use dark gray to fill in her bodysuit and head gears. Step six, I render some basic lighting on her face and her shiny leather skin tight bodysuit.